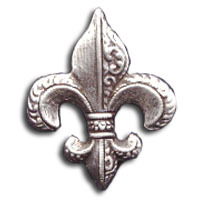 The Fleur de lys is a stylized lily or iris. It is seen in the French Royal Arms and in English arms up to 1801. It is the symbol of Purity and light. It also was used to distinguish the sixth son of a family. This piece is made in pewter, measures .75" x 1", and comes with a standard military clutch back.